One of my favorite songs is an oldie, written in 1983 by a group known as Maze featuring Frankie Beverly. Whenever this song starts playing, the adrenaline rushes through my body and I can’t help but to smile, sway, and sing along. This song has always represented both a critique of how we are living and an acknowledgement and hope for how we are called to live – as one. Of course, as we survey the landscape of our world, it doesn’t take long to acknowledge that we need a harmonious sound, one that can reach through the uniqueness of our differences and remind us of our common purpose. In a world overtaken by divisions – divisions that corrode the fabric our beings and leave us standing exposed to the elements of hatred and evil, we need a song of justice and unity. When our churches, homes, schools, communities, and nation focus more on how to erect walls of division, rather than bridges of connection and opportunity, we need a song. This week, as we reflect on the ways in which love manifests in our lives, my prayer is that our call to love will move us to break through the silence and sing. 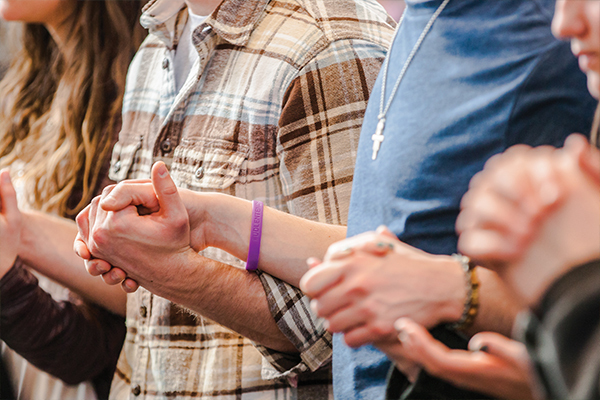 Become a RCIA Prayer Partner! In RCIA, it is important for the whole community to be an active, engaged part of the process.